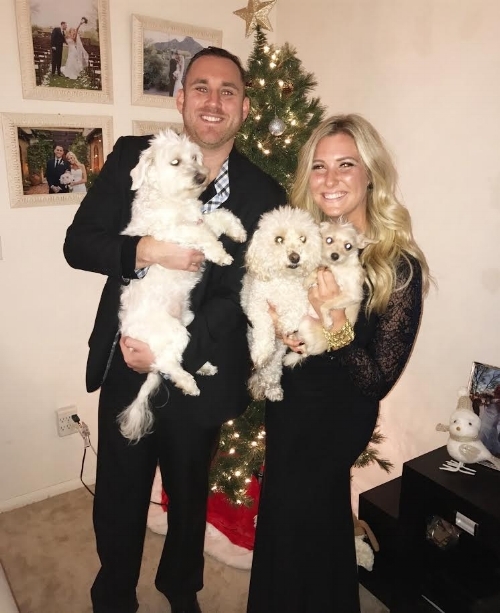 My husband and I already had 2 dogs of our own, Brody & Charlotte… but I was eager for even more pups in my life, so I became a volunteer for Wags. Initially, Tiny was my foster pup!! She was in very poor condition when being found- she was full grown and only 2 pounds, she hadn’t seen food or water in 10 days, and was terribly ill with pneumonia. Over the course of that first month, I went back and forth, back and forth, dozens of times to the vet in order to nurse her to health. She was on round the clock IV drip and the nurse had prepared me for the worst due to the immense clogging of her lungs. During that time (obviously) we bonded… and ultimately I decided I just couldn’t let her go. Through my friend- Sarah Anderson! She adopted Benny in March 2016, shortly before I found Tiny in May 2016!! We had already been through so much together because of how sick she was and how much nurturing she needed, but I knew she was “the one” once she was healthy again and Wags told me she was healthy enough to begin the meet & greet process (because she was still just my foster!!). Due to already having 2 dogs I wasn’t sure if 3 would be too much to handle… so I went ahead to the first meet & greet with her and when I saw Tiny with the family I was heartbroken… I drove home from the meet & greet completely SOBBING and was praying that the family decided to go with another dog. They did!! After that, I felt it was fate that she was meant to stay with me!! No big challenges!! She has blended seamlessly into our family. Biggest surprise is how loving and sweet she is after what she’s been through. Our biggest surprise is how much she’s changed physically just from being sick to being healthy. She was full grown and 2 pounds when we got her… and now she’s 4.5 pounds (and not from being 1 year older, simply because of health)!! It’s amazing what proper eating & TLC can do!! She was so emaciated before, skin & bones… and now she’s the happiest most beautiful little angel!! We always laugh at how funny she is!! She has quite the personality. Any time there is a blanket around, or if we are in bed… she groans at the edge of the blanket/bed sheets… telling us to lift up the corner so she can crawl wayyy under!! A blanket is too heavy for her to lift on her own!! Also, she has bonded deeply with a teddy bear!! My husband came home with flowers and a teddy bear last Valentine’s Day and instantly Tiny wanted the bear. She brings this bear everywhere!! At bed time she’ll run out to the living room, grab “Beary” and drag him to bed… and then whine for us to lift him onto the bed for her! In the morning, she brings Beary with her to the patio and they lay out in the sun together. Being a doggy parent is the best feeling and I could never have imagined how much love that a dog could bring into my family. I am obsessed with my fur babies and would give anything for them!! Seeing them smile and seeing their tails wag fills me with immeasurable joy. I cry all the time now… lol!! There’s just so much love all around and I want to hold on to each moment (furrever)! I would just like to thank Wags & Walks for being such an incredible organization. Brody, Charlotte, and Tiny (& Beary) are the bestest of friends and I love being their mommy!! Thank you Kelly for sharing your touching story and welcoming Tiny with such open arms. We are so happy that Tiny fits so perfectly into your family! Newer PostWhat is a Puppy Mill?